The six- or multi-row form grows to heights of 1.2 meters. In the multi-row forms there are three grains per attachment, in the two-row forms only one. Typical for all barley types are the long awns. The shape of the ears range from short and thick to long and loose. The straw is relatively soft. 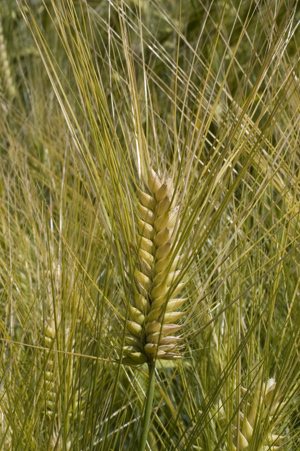 Barley is counted among the self-fertilizing plants. 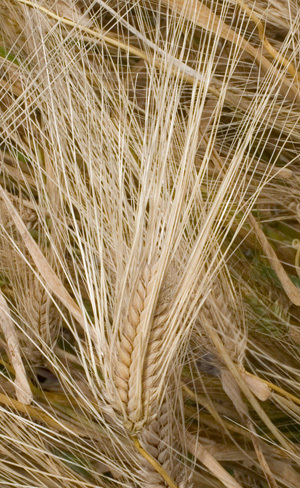 The six-row barley was cultivated long before the two-row barley. Only the six-row barley made it to Central Europe in prehistoric times. They have a strong stem. The two-row barley conversely has a finer stem. It is however not dissimilar in terms of stability. The smaller amounts of seeds per ear in two-row species is compensated by a larger amount of ears per square metre. The six-row barley was widespread, over time the two-row forms became more common. Today both forms can be found. In prehistory only six-row forms with stout compact ears were planted. Later also these with looser ears. The compact forms, also known as Pumpergerste, are now rare, some are still conserved in seed banks. The medium-thickness types now are the most widespread. Winter barley is more productive and is seeded in September. The development of lateral growths occurs before winter. In spring stems that bear ears grow from them. After tillering, bolting, "Ährenschieben" there is blooming. The winter barley usually begins the Harvest. The land barleys are barely usable for cultivation. They are too unstable. They are much more important for breeding. A number of resistance factors to black rust and fusarium have been found there. Flour, porridge, soup, sauce, roux, beer and malt and in medical cooking the decoction, barley slime, is used. Milk production by cows is increased with a little barley. Barley needs a well prepared seeding ground. There are many six-row barleys types left in the Swiss national gene bank. There are only a few which are still cultivated, since many are too fragile even for biological agriculture. The shape of the middle seed is different from that of the seeds at the margins. The central seed is symmetrical, the lateral ones are slightly kinked. Thus one can tell from the seeds whether they are two-row or six-row types. Schilperoord, Peer (2013): Kulturpflanzen in der Schweiz - Gerste. 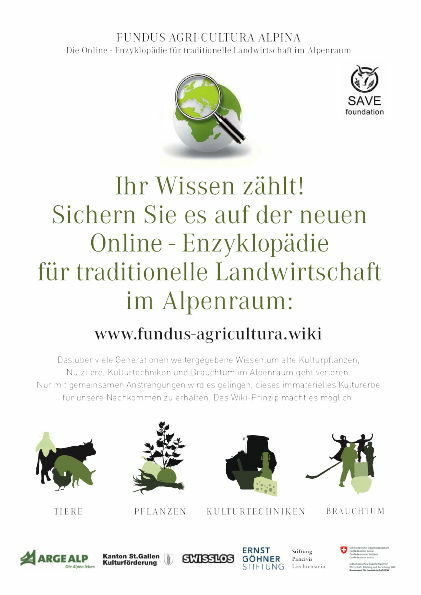 Alvaneu Dorf: Verein für alpine Kulturpflanzen.